Vermont Senator Bernie Sanders unveils his long-awaited single-payer healthcare bill. Family owned Nordstrom moves closer to going private and the photo of the day is Boston like you haven't seen it. Here's what you need to know now for Wednesday, Sept. 13. Healthcare reform is here. Well, not quite, but we've got a new proposal to comb through. No, not from the much maligned GOP, but from the Dems, sort of. Vermont Senator Bernie Sanders on Wednesday unveiled his long-awaited single-payer healthcare bill. Backed by 16 Senate Democrats, the legislation would transition the U.S. healthcare system to a single government-run plan that covers all Americans. Sanders' plan is murky on the details of costs and financing, reflecting broader problems plaguing the U.S. healthcare system. While President Donald Trump was likely chuckling at the possibility of universal healthcare, the president on Wednesday issued an order blocking Chinese government-backed Canyon Bridge Capital Partners LLP s $1.3 billion plan to acquire Lattice Semiconductor Corp. (LSCC - Get Report) . The transaction proposed numerous national security, the White House said, including the fact that Lattice's products are used by many government organizations. While one merger was officially dealt a knockout blow, another deal to help save a company from a TKO seems to be taking shape. Nordstrom Inc. (JWN - Get Report) is inching closer to going private, and thus, closer to returning to robust business. The family-owned company is nearing a with private-equity firm Leonard Green & Partners LP to help fund a buyout, that will take the company off the public markets during a trying time for retail. A deal would not only allow 116-year-old Nordstrom to really focus its efforts on a turnaround but it would also allow the founding family, which owns about a third of the stock, to preserve its legacy of running one of the most successful high-end department stores in the world. Meanwhile, TheStreet was able to garner an opinion on the most watched company in the world, Apple Inc. (AAPL - Get Report) , but not from your typical Wall Street analyst, broker or trader. Kiss legend Gene Simmons, an avid investor in his own right, was in the office at 14 Wall Street today to discuss why he is bullish on Apple. I'll give you a hint: It's got a little to do with music but that's not the whole story. "They used to make steel there, no?" a European mobster asks a stevedore union leader gone bad as they look out on an abandoned factory in Baltimore's harbor in an episode of "The Wire," the great HBO series set in Baltimore. If it's up to Kevin Plank, they'll design athletic shoes and apparel, make whiskey and house wealthy tourists instead. Plank, the founder and CEO of Under Armour Inc. (UAA - Get Report) , is attempting to reinvigorate the city with a visionary plan for 235 waterfront acres once devoted to industry. Thought it could take a generation to implement, Baltimore is used to hardships having dealt with a manufacturing exodus in the mid 20th century that left much of the once-bustling city desolate and barren. 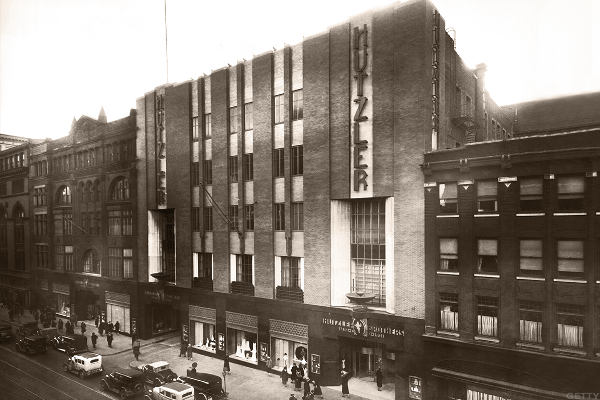 Above is a photo from the 1930s displaying the Hutzler's department store in Baltimore. A Baltimore institution until its wind-down in 1990, Hutzler's is a symbol of the heyday of the Charm City that once featured a bustling steel industry and one of the busiest ports in America that helped support a robust consumer economy.